1. Made of non-toxic medical-grade PVC. 2. With soft cushion and transparent shell. 3. 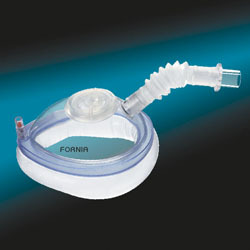 Allows simultaneous ventilation and bronchoscope or gastroscopy. 4. The ventilation ports of telescopic pipe can be rotated 360°, allowing an arbitrary placement of breathing machine.